The year is 1684. Twelve-year-old Eustache Bréman leaves behind a life of misery begging on the streets of France for a second chance in the New World with with his mom, his sweetheart Marie-Élisabeth, and Marie-Élisabeth’s family. But life is tough, with plenty more tragedy and disappointment to come on Cavelier De La Salle’s ill-fated expedition to the Mississippi. Join Eustache as he comes of age in Louisiana. This YA novel in sparkling English translation is every bit as modern and playful as Camille Bouchard’s original French, which pleased people of all ages. 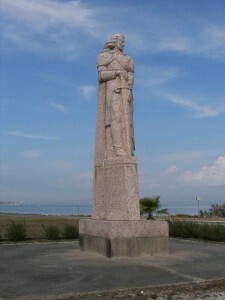 Monument to Cavelier de La Salle, Indianola Texas where Eustache Brémen and the others settled during La Salles ill-fated expedition. Camille Bouchard transports readers, young and old, across continents and epochs. He never stops writing and travelling. Governor General’s award winner and a five-time finalist, he is the author of more than 80 novels for readers of all ages. Some works appear on international selection lists, including the White Ravens International List of Honor. 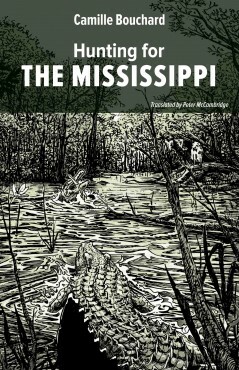 Hunting for the Mississippi is Bouchard’s first book to appear in English. “A literary phenomenon.” Le Devoir. “A leader in historical fiction.” La Presse. “Exciting and daring.” “A remarkably gifted story-teller”, CBC/Radio-Canada. Peter McCambridge is an award-winning literary translator. He founded and heads the Québec Reads webzine and now runs QC Fiction, a publishing imprint of contemporary Québec literature in translation. Peter McCambridge has also translated the first three volumes of the popular YA historical fiction series The Adventures of Radisson, 1, 2 & 3. Pub Date: May, 2016. Paperback now available for pre-order.